Charlottesville, Va., Nov. 15, 2016 - When the Richmond Marathon started on Saturday, Nov. 12 it was only the second time that Andy Beardsley and Larsen Klingel had competed together, despite being childhood best friends. "We met when I moved to Alaska in the fifth grade," explained Beardsley, who serves as not only the head coach of the co-ed Cross Country team and assistant coach of the co-ed track team, but also as a dorm parent, advisor, and Upper School humanities teacher at St. Anne's-Belfield School. "I ran throughout high school and Larsen always watched, he always cheered for me. It's been on my bucket list to do something like this. In fact, I've wanted Larsen to move down here by me so we could." By "this," Beardsley means compete together, with Beardsley running and pushing Klingel, who lives with cerebral palsy, in a custom-made wheelchair produced in Boston by the same manufacturer that produces chairs for Team Hoyt, a famous father and son team which competes in marathons and triathlons with the assistance of adaptive equipment and mobility aids due to son Rick's cerebral palsy. Before placing the order, Beardsley sought permission from Head of School David Lourie to paint the St. Anne's-Belfield School logo on the wheelchair. "I just love St. Anne's," he said of the design decision. 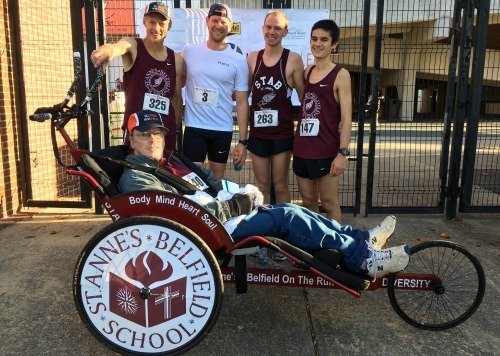 Though ordered months in advance, Beardsley and Klingel only received the wheelchair the night before their first race together, the Nov. 6 Bill Steers Men's Four Miler in Charlottesville. The men competed with the School's other Cross Country coaches Adam Colombo, William Sbach, and Stewart Sackson (pictured above). With the completion of the Richmond Marathon and qualification for the 2018 Boston Marathon, Beardsley and Klingel are considering adding a fundraising component to their runs though the main motivation has always been to spend time and compete together. "He's an inspiration to me and always has been," said Beardsley. "We're just great buddies!"